Incredibly quirky and creative summer songs with a weird twist. Is the EP about love during the summer, or an alien invasion? You decide! Gnarly lo-fi synths with experimental accompanying instrumentation. A must-listen for those weirdos out there. 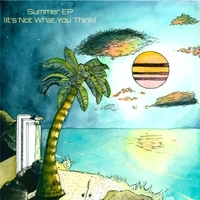 The EP was meant to maintain an unsettling summer aesthetic, which challenges the conventional interpretation of Summer music, which is usually very happy and upbeat. Many of the songs featured on the EP have punishing tempos of well over 160 bpm, which maintains the upbeat attitude, but the melodies always provide a slightly unnerving aspect to them. Tanner Mackey's Summer EP (It's Not What You Think) was meant to be able to be interpreted in two very different ways simultaneously that would fit this unsettled summer aesthetic. The first, was inspired by a short but volatile relationship with a beautiful redhead named Summer, and is meant to fit the typical "summer love song" trope. The lyrics can be viewed as various stages of a relationship and developing/losing feelings for a girl. The second, and much more exotic interpretation is that of an alien invasion during the summer. Every song contains cryptic messages and vague references to unsettling imagery such as "pillars of light" and blood splattering the walls of filling the ground. If looked at in the right mindset, the themes could easily change from carefree summer love to themes of abduction, desperation, being torn apart, and misery. The creation of this EP allowed Tanner to expand his production and musical abilities, while also further exploring what makes an aesthetic a "surf aesthetic" which is what he plans to create his next album entirely in, with the help of some other musicians. You can look for it around Spring 2018!